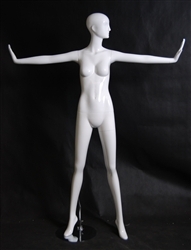 Female mannequin with sculpted hair and face. Ready for any merchandise display. She comes in white. Arms and leg and torso are removable for easy dressing. Comes with round chrome base.